VTech Smart Wheels Repair Shop Just $13.59! Down From $22! 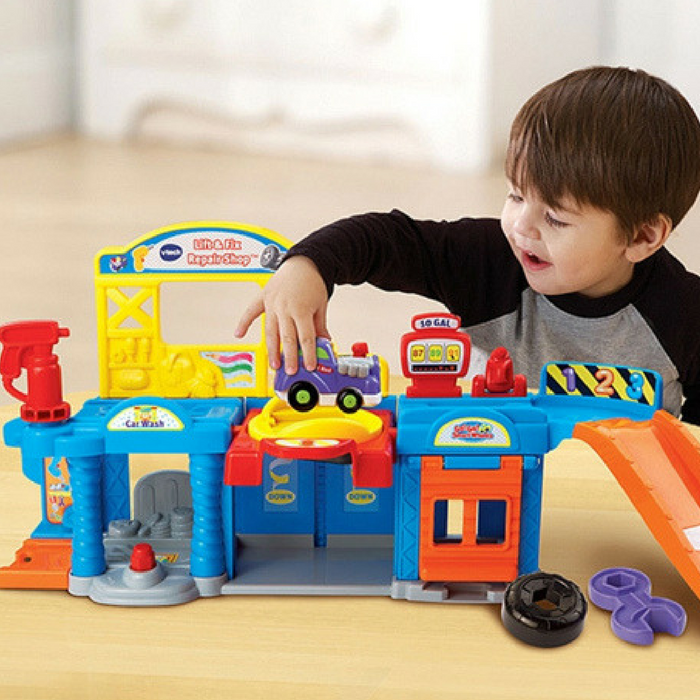 You are here: Home / Great Deals / Amazon Deals / VTech Smart Wheels Repair Shop Just $13.59! Down From $22! Amazon is currently offering this VTech Smart Wheels Repair Shop for just $13.59 down from $21.99 PLUS FREE shipping with Amazon Prime or for orders over $25! Lift, fix and learn with Howie and his hot rod at the Go! Go! Smart Wheels Lift and Fix Repair Shop by VTech. Roll the SmartPoint hot rod over five SmartPoint locations to hear different phrases, music or fun sounds effects. Press the toy hot rod’s light-up button to hear three sing-along songs and learn the letter H and the vehicle name. Build motor skills by placing the hot rod on the car lift and raising it to the second level, or pretend to repair, paint or fill it up with gas. For more role-play fun, the toy repair shop also includes a wrench and tire accessory!